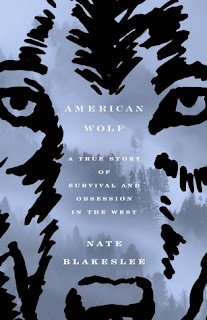 American Wolf by Nate Blakeslee. Crown Publishing, 2017. Ebook. 320 pages. Wolves are truly amazing animals. I have grown up in a household that has taught me to love and appreciate wolves, largely because my mom is a huge wolf fan and therefore I am now also a fan of wolves. Thus, when I saw a book on NetGalley that boasted to tell "the enthralling story of the rise and reign of O-Six, the celebrated Yellowstone wolf, and the people who loved or feared her," I knew I had to pick it up--and I'm so glad I did! American Wolf is an in depth telling of one of the most famous wolves of Yellowstone, referred to as O-Six, and how she survived despite many odds being stacked against her. Along with this story, however, Blakeslee also includes immense background detail on the other wolves released and raised in Yellowstone, the conflicts between hunters, wolves, and livestock, and the many wolf watchers that took part in observing O-Six's life-- along with many other wolves. Blakeslee tells the story of O-Six in an incredibly compelling manner that at times feels more like I'm reading a fiction story about wolves than I am reading a nonfiction account of the lives of various wolves. It is apparent that Blakeslee has done much research for this book and he takes great care to provide detailed and illuminating information on this subject. I was particularly fascinated when reading about the different behaviours displayed by O-Six and many others. I knew a somewhat decent bit about wolves coming into this, but there is so much more to learn about them. The way the packs function and how new packs are formed or destroyed is really rather remarkable. They are such fascinating animals with such distinct and familiar traits that sometimes it seemed as if I was just reading about people and royal families. American Wolf also dives into much of the debate surrounding wolf hunting and the various political and environmental ramifications of those both for and against it, which I was pleased to see, as it helped me to better understand the entire situation. He also discusses many of the specific scientists, wolf watchers, etc. that spend so much time studying the wolves, which I also found interesting. There were a few instances in which I felt that Blakeslee went on slight tangents or just into a bit too much detail of something that wasn't quite relevant, but overall most topics seemed to fall into place with the topic of the book. One thing that I struggled about a bit with this book was the fact that the wolves didn't have set names, but were instead referred to by numbers or descriptions (i.e. 574, 'Shy Male,'). I understand that this is because they didn't want the wolves to seem like pets, but it just made it a bit confusing at times to recall who is who. I'm not really counting that against Blakeslee, however, because that's not really his fault, but it is something that I felt I should point out. Overall, I've given American Wolf four stars!